A Deluxe Set Of Drinking Straws Can you imagine sipping your aromatic coffee or your refreshing cocktail with a sleek stainless steel drinking straw that would add a unique stylish touch to your drinking experience while respecting the environment? Indulge In The Classy Feel Of A Set Of Stainless Steel Reusable Straw Forget all about plastic straws that add to pollution and treat yourself to the deluxe experience of this exquisite set of 4 high-end straws that will take your enjoying a fresh juice or an ice cold cocktail to a whole new level! 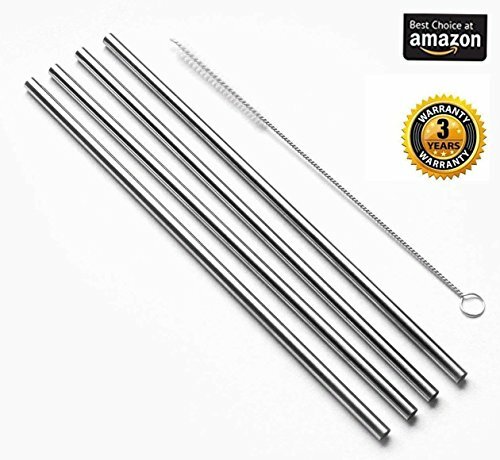 Made of durable stainless steel and intended for lifelong use, these ultimate quality shiny straws will be a stylish replacement for common disposable drinking straws, making your guests’ heads turn with admiration in your next cocktail party, Sunday BBQ, party favor or family reunion around a festive table.